Center of Science and Technology: Help me make these students famous! Because they deserve it! because we can. To raise money and awareness to allow those bright minds to individually thrive in life, in University, in their community and on a global scale! Students are the voice of tomorrow. Youngsters are the spring of the nation! kids are the leaders of the next generation! The COSAT learners are the most amazing and inspiring individuals I met in my life! I have learned a lot about myself via them, and still do. Youth empowerment in the Townships of South Africa is needed. Poverty is a daily issue. Role models are needed! Guest teachers wanted! Connections wanted! Resources welcome! Donations lovely! Those students want to learn, they want to make a difference, they want to lead by serving others, they want to set the example in the new South Africa, be part of transformation in Africa! All they need is opportunities and Eye-openers to see the opportunities. Those students are the change you want to see in the world! The work the students have done in the ‘art and leadership’ classes in 2008 is amazing: photographs, artworks and essays to show you what matters to them. Those 15 year old individuals have each found their mission in life. Let them inspire you to stay true to your own mission! Help me get this book published! Help me get their site online! Help me get the message out there, really…help me get those students and this school (the only school in South Africa with IT as a matric subject, with such an amazing free education!) be famous! Be creative in your cooperation! – bloggers/online media guru’s/marketing consultants we want some courses! – a schoolbus and a driver! Ok, I can keep on going. Dream big is what one of the South African bloggers and online professionals, Darren Smith, told me to do. Hey all you South African bloggers, online professionals, companies, intellectuals, connected ones, tech-savvy people…make sure the next Wordcamp SA is one with lots of color, representative for your country. Make sure the whole South African population is on top of the innovation, online applications, mobile technology. Make sure there will not be another heated discussion about the color of the South African blogger. Invest in the future! Be the change you want to see in the world! Hey you international community, all you clever entrepreneurs, policy makers, …the world is your playground. Make sure everybody is having fun! That includes the ones that are not part of your conversation, innovation, partnerships,..at the moment. Be bold. 2009 is waiting for you.. Your action to empower Young Mobile reporters! Do you want to know more about those amazing South African ladies (Zintle Sithole and Lukhona Lufuta) who will be contributing at the Afrigadget blog? I don’t consider myself a real ‘techie’, but I do have a strong passion for technology. And although the word ‘geek’ is often used in obsessive computer/technology/connectivity situations, looking at the explanation on Wikipedia makes me think: Yes I am a geek. A big one. I am obsessed with combining my passions (humanity, technology, design, leadership). I am a people loving-passion following-intercultural connecting-voices facilitating and human empowering GEEK. Last year I attended the Web of Change conference in Canada. Being among some of the brightest web focused changemakers from The States and Canada was extraordinary. People like Peter Deitz, Marc Laporte, Michael Silberman and many others inspired me to hold on to the thought that technology can make a difference in the lives of many underprivileged people. Attending the (mostly white) Wordcamp South Africa (a gathering of fans of the open source blogging software WordPress ) opened my eyes to how big the gap between technology implementation in the privileged (mostly white) and implementation and usage in the underprivileged (mostly black/colored) communities is. Recently I visited MobileActive08 in Johannesburg. A (to me) very inspiring, but also overwhelming mix of geeks, techies (including Google, Microsoft,..), funders and implementers, who all make a difference in the world through mobile technology. I was blown away by what is already being done with the mobile phone in the developing world. A few personal highlights: meeting Erik Hersman and getting to know the crisis report enabling Ushahidi and listening to Guy Berger and his Journalism project The News is Coming in Grahamstown, South Africa. My insecurity at conferences tells me: What am I doing here? Where’s my IPhone/blackberry/apple computer? How do I talk tech? How on earth do I catch up with all knowledge in this audience? It is like being back at University…..I don’t belong here. Fortunately, my secure and balanced me says: does it matter? My vision is clear, my passion is big. Go and explore girl, make those connections, learn as much as possible. Major Non-profit organizations have their own Technology consultant on board and come up with the most creative and innovative uses of technology on the ground. Great. But…. I wonder: How to get the message of what is possible with technology out to the many “heroes in underprivileged communities”??? How to hear the needs and ideas of young brights minds in the developing world??? How to empower Africans by African ingenuity??? How to have Africans say NO to the brain drain? How to have Africa really be in the hands of Africans!! How to improve the implementation of Technology in order to eradicate poverty/empower the underprivileged/bridge the implementation gap? Improve the language of technology: right now it is too techie and not easy accessible for all. It can not be read/reached by the communities on the ground that know best what is needed in their village. Include (underprivileged) youngsters!! The bright minds of the future should be included in the conversation of today! Let them be inspired and generate ideas! Support bridge figures! Give them a feeling of -belonging- in the world of Men and Tech! Create (more) scholarships for fancy conferences!! I am so happy that I was able to step over my own foolish insecurity and explore and exchange at the above mentioned conferences. Great things come out as a result! 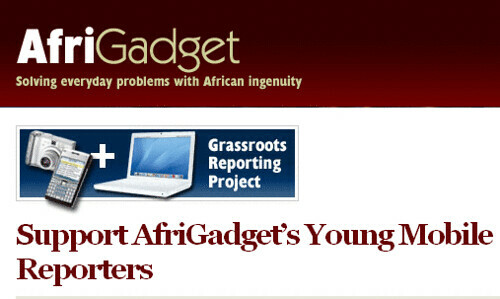 Me being the connector enables underprivileged students from Khayelitsha to become mobile reporters on Afrigadget !!! Being a bridge is the best! Thanks COSAT learners! And thanks you Tech-savvy global inhabitants!